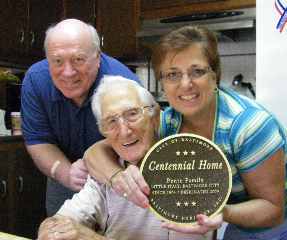 John Pente with daughter Margaret Schwartz and son-in-law Al Schwartz. Photo by Lisa Doyle. To many residents of Baltimore’s Little Italy, John Pente is a well-known neighbor. At ninety-eight years old, he has been involved in the community for close to a century. The quick facts of Mr. Pente’s life may appear like a typical Baltimore story. He attended St. Leo’s, a local parochial school, and then Calvert Hall, graduating in 1930. As a teenager, he worked at various neighborhood businesses. Some of his afterschool jobs included shining shoes at a barbershop and shucking oysters for the grocer Maruzziello. Due to the Depression in the 1930s, Mr. Pente, like many others, had difficulty finding a job, even with a high school diploma in hand. The only employment available was at a paper bag company, attaching handles to shopping bags for a wage of twenty cents per hour. He stayed with the company for about thirteen years before moving on to Western Electric. During his adult life, he directly took part in the neighborhood’s organizations by volunteering at St. Leo’s Church as a maintenance man and became a member of the local Sons of Italy branch. 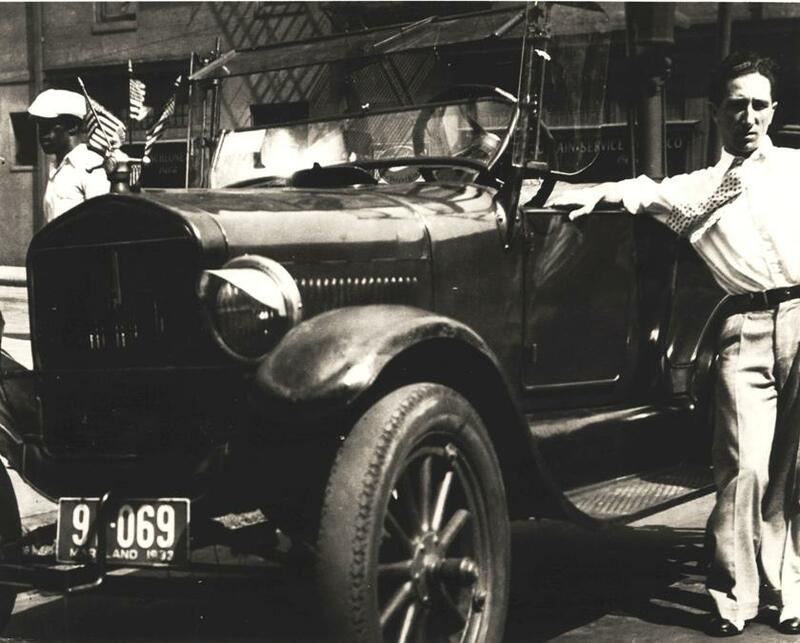 John Pente posing with the Ford Model T he purchased in the 1930s for about twelve dollars. A closer look reveals just how much John Pente has become a cherished member of the Little Italy community. His current house at 222 South High Street is marked with a plaque from the local restaurant owners, a gift of thanks for his participation in the annual summer movie festival. For the past ten years, he has allowed a projector to run movies from his bedroom window onto an open-air screen across the street. The event draws hundreds to the crammed streets, but Mr. Pente enjoys seeing both local Baltimoreans and foreign tourists in Little Italy. He is quick to share his love of the neighborhood, which is characterized by its eighteen Italian restaurants and people socializing around sidewalk benches. Although Mr. Pente himself has lived and contributed to the Little Italy for many decades, a member of the Pente family has owned 222 South High Street for 104 years, with ownership changing hands through the years. Currently, John Pente still pays ground rent to a descend ant of the original English owner. The Pente’s resided next door at 220 South High Street for several decades as well. John Pente grew up in that house with his older brother Angelo and his sister Rosa. Rosa Pente continued to live there after she married Ed Lancelotta, raising her own children in the home. It was only recently sold to a non-family member when she passed away at ninety-four years old. The tale of the Pente family, and how they came to reside in Little Italy, begins with John Pente’s grandfather, Angelo the elder. He arrived circa 1893 as an immigrant from Abruzzi, Italy. Initially, Angelo Pente settled with his wife and young son around President Street. They rented rooms because they could not afford to buy a house. At the time, the neighborhood had a majority of German, English, Irish and Jewish inhabitants. The newcomers, mostly Italians, found employment in the railroad industry or as cooks and laborers in the hostelries surrounding the railroad. Angelo Pente worked as a locksmith but eventually opened a shoe repair shop on the 600 block of President Street. Also a musician, he played instruments in t he streets to earn extra money. 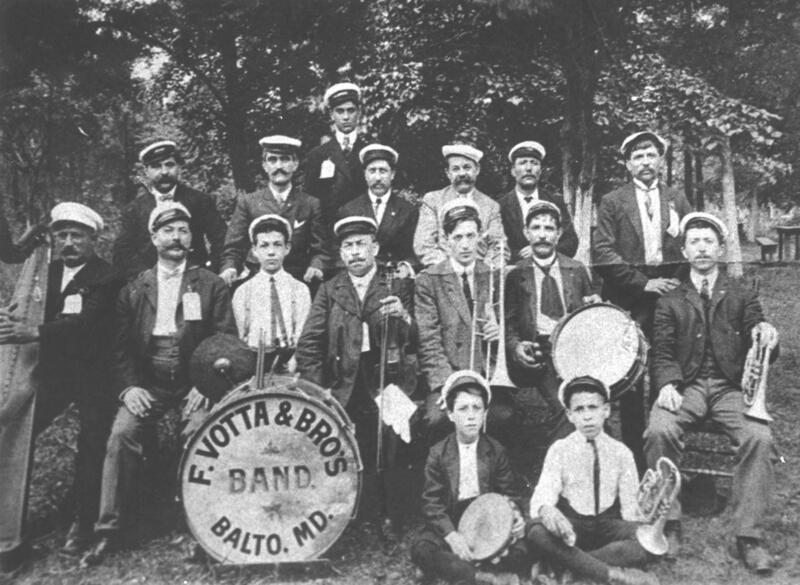 A group picture of the Frank Votta Band, c. 1904-1905. 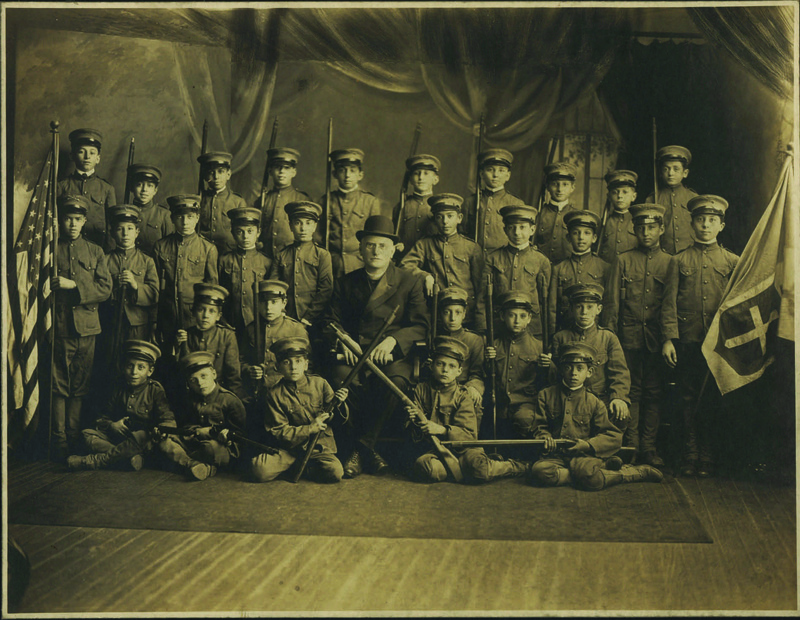 Joseph Pente is seated in the second row, far right holding a trumpet. His younger brother Nicholas is seated on the floor holding a tambourine. With trumpet and drum, alongside his full-time day job, Angelo Pente saved enough money to buy the house at 222 South High Street in 1904. As his grandson John Pente explained, “The Italian people always believed in buying the house first.” In an interview, he described the original house as having gas burners, no electricity and two outhouses in the yard. His grandmother kept boarders on the third floor, providing meals for them and washing all their clothes. Although Angelo Pente managed to afford a house, the family still had to pay a mortgage. Money from the boarders contributed toward the expense, but he also continued to play music on the street. As they grew older, sons Joseph and Nicholas joined their father and the trio would make about three dollars per night. Music remained an ongoing part of their lives throughout the years. Angelo Pente played the snare drum as part of a “Shoe-Makers Band” which marched for feasts and parades. 5 Joseph was a member of Frank Votta’s band in the early 1900s; they performed for everything ranging from all-day crab feasts to school commencement dances. 6 Nicholas, the younger son, became a fu ll-time professional employed in the local theater orchestra as a trumpet player. After serving as leader of an army band of musicians during World War I, he opened up a music repair shop in the family home at 222 South High Street. After his uncle Nicholas passed away in 1941, John Pente moved into the house with his wife. He gutted and restored the home, doing all the work himself. The same year, Mr. Pente began a job at Western Electric, where he would be employed for thirty years. Alongside his wife Margaret, he raised three children in the house. Although John currently lives alone, his son Joe comes every Tuesday night for dinner, as he has been doing for the past seventeen years. His other children and grandchildren visit often, and John keeps the large Pente family grounded to their roots in Little Italy. John Pente and his family have lived through the many changes brought to the twelve square blocks of the neighborhood, which is bounded on the north by Pratt Street, on the south by Eastern Avenue, on the west by President Street and on the east by Eden Street. The area became known as Little Italy around the 1920s, when the first restaurant opened, serving soup to local workers. Yet the Italian population established itself well before the twentieth century. They laid the cornerstone for St. Leo’s Church in 1880, at the intersection of Exeter and Stiles Streets. A school later opened adjacent to the church around 1910, though it has since closed. St. Leo’s is still the heart of the Little Italy community according to John Pente. For many residents it is the location of all their important religious ceremonies from baptisms to marriages. 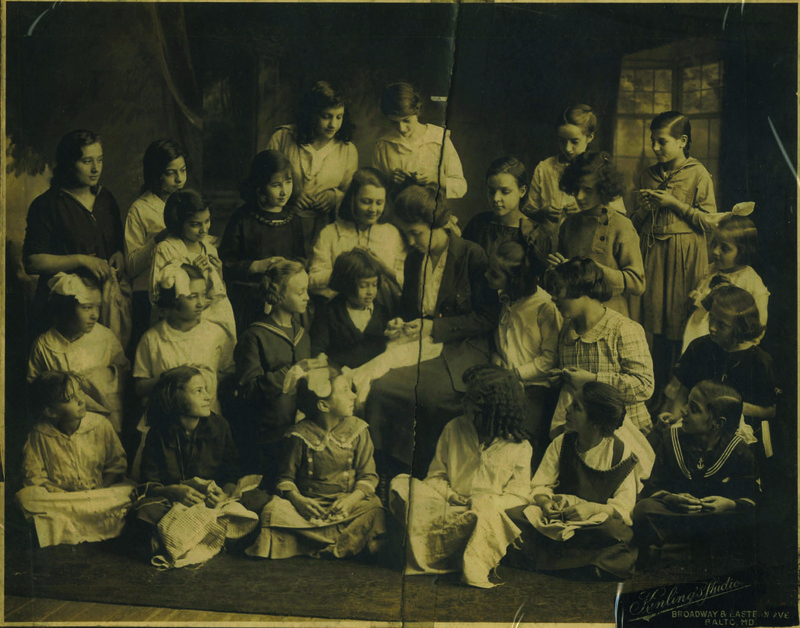 A sewing class of St. Leo’s. Rosa, John Pente’s sister, is pictured on the bottom row, third from the left. The neighborhood was spared from the great Baltimore fire of 1904, and the feast of St. Anthony reminds everyone of the disaster that almost happened. As the story goes, the saint’s intercessions saved Little Italy, and residents have been celebrating his feast day in June ever since. 8 Other local traditions includes the St. Gabriel festival in August, the Taste of Italy in September, when all the restaurants get together and have samples of their food out in a parking lot, and the Columbus Day parade in October. The community also had its share of uncertain periods. After World War I, many returning veterans decided to move out of Little Italy. They bought homes in new neighborhoods like Highlandtown. The exodus continued even during the 1970s, when young people with college degrees decided to move out to the suburbs. Yet the neighborhood is nonetheless flourishing today, and perhaps nobody is more proud of its current success than John Pente. He has witnessed many of its changes and transformations, all the while remaining a constant presence. Mr. Pente exemplifies the dedication and commitment that gives a community its character, but he is also a living symbol of the entire Pente family’s mark in the urban landscape of Little Italy. The future of the Pente legacy looks promising, since John’s niece is contemplating a move back into the neighborhood.